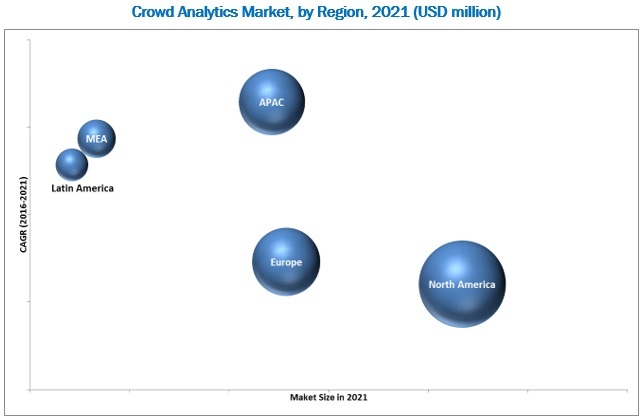 [141 Pages Report] The crowd analytics market size is estimated to grow from USD 385.1 million in 2016 to USD 1,142.5 million by 2021, at a Compound Annual Growth Rate (CAGR) of 24.3% during the forecast period. In the report, 2015 is considered the base year while the forecast period is 2016–2021. Crowd analytics is the analytics applied over data that is collected with respect to the movement and behavior of the crowd in a particular area, such as a retail store, restaurant, or bus station. Various means of collecting such data include Internet Protocol (IP)-enabled video cameras, sensors, mobile phone beacons, and data collected from telecom operators. The solution greatly helps in strategy making with respect to the delivery of services, pricing, marketing, and site selection for businesses, resulting in optimized revenue generation. Increasing crimes, terrorist attacks, and other security threats have raised governments’ and defense bodies’ concern for the defense and security of critical facilities, commercial buildings, and safety of its public. Crowd analytics helps governments in probing suspects in advance by analyzing their behavior and activities from the captured visuals. Thus, it helps governments take a proactive approach to fight against domestic crimes and terror attacks and reduce it to a certain extent, year-over-year. The capabilities of intelligent surveillance systems, such as pattern recognition, incident detection, and facial recognition, allow end users to receive early alerts about the potential risk and threat situations, which enables end users to make advanced decisions for mitigating such situations. The crowd analytics ecosystem comprises crowd analytics vendors, such as Nokia Corporation (Finland), AGT International (Switzerland), NEC Corporation (Japan), Walkbase (Finland), Spigit, Inc. (U.S.), Wavestore (U.K.), Savannah Simulations AG (Switzerland), CrowdANALYTIX, Inc. (U.S.), Securion Systems (Ireland), Crowd Dynamics (U.K.), and Sightcorp (The Netherlands); service providers; system integrators; and enterprises. Other stakeholders of the crowd analytics market include crowd analytics service providers, consulting service providers, IT service providers, resellers, enterprise users, and technology providers. In October 2016, NEC launched an artificial intelligence software NeoFace Image data mining (NeoFace Idm), which has the capabilities to search video for specific individuals and to search for subjects who appear at specific times and locations. In September 2016, Nokia launched Network Planning and Optimization (NPO) transformation service that leveraged on its global planning and optimization expertise, innovative software tools, and proven methodologies. This offered more agility to operators, helped them meet customer demand, and enabled them to tap into new business opportunities. In April 2016, Spigit launched a new mobile experience that helped organizations generate ideas by enhancing their employee engagement and collaboration. The crowd analytics market size is expected to grow from 385.1 million in 2016 to 1,142.5 million by 2021, at a Compound Annual Growth Rate (CAGR) of 24.3% during the forecast period. The major growth drivers of the crowd analytics market include the need to install new and advanced surveillance systems and the growing need for business intelligence solutions. Crowd analytics is the analytics applied over data that is collected with respect to the movement and behavior of the crowd in a particular area, such as a retail store, restaurant, or bus station. Various means of collecting such data include Internet Protocol (IP)-enabled video cameras, sensors, mobile phone beacons, and data collected from telecom operators. The solution greatly helps in strategy making with respect to the delivery of services, pricing, marketing, and site selection for businesses, resulting in optimized revenue generation. Some of the prominent verticals that apply crowd analytics are Consumer Packaged Goods (CPG) & retail, transportation, media & entertainment, and travel & tourism. 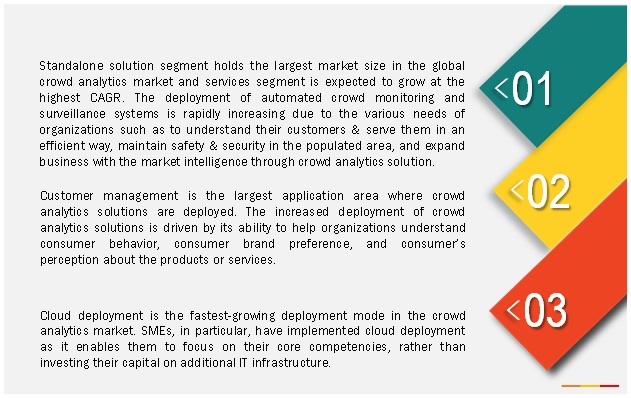 The crowd analytics market is segmented by standalone solution, service, application, deployment mode, organization size, vertical, and region. The services segment is expected to grow at the highest CAGR during the forecast period; as the deployment of crowd analytics solutions is increasing, so the services associated with it is also growing. Customer management application holds the largest share of the crowd analytics market in 2016. The growth is fueled with the increasing need of business intelligence solutions by the organizations to understand consumer insights and strategize business to achieve long term growth. The travel and tourism vertical is expected to hold the highest CAGR during the forecast period due to the rapid growth of the sector needing real time data and business intelligence solutions to understand consumer insights and expand the business. Organizations are rapidly deploying crowd analytics solutions either on-premises or on cloud. The demand for cloud-based crowd analytics solutions is increasing due to the cost-effective and time-efficient features of cloud; its growth is specifically high in enterprises, where low cost solutions are much required. The global market has been segmented on the basis of regions into North America, Europe, Asia-Pacific (APAC), Middle East and Africa (MEA), and Latin America to provide a region-specific analysis in the report. The North American region, followed by Europe, is expected to become the largest revenue generating region for crowd analytics vendors in 2016. This is mainly because in the developed economies of the U.S. and Canada, there is high focus on innovations obtained from research and development and technology. The APAC region is expected to be the fastest-growing region in the crowd analytics market. The growth in this region is primarily driven by the growing need of business intelligence solutions and the need to install new and advanced surveillance systems. The global CPG and retail vertical is growing rapidly. The huge customer base is helping the sector to generate huge revenue. The competition in the field is also stiff and there is a possibility of brand switching by the customer due to dissatisfaction from the existing one. Thus, the enterprises in the industry are focusing on customer management functions, but it is very difficult to manage large numbers of customers. The crowd analytics vendors offer crowd analytics platform that collects the information about footfall, stay’s duration, movement patterns, and returning visitors to analyze the crowd in retail store premises. The visual outcome of crowd analytics solution shows the detailed analysis of the crowd, which help the retailers to make business decisions in an effective way. The different transportation means such as road, rail, and air transport are witnessing the challenges of time and cost reduction and at the same time maximizing the efficiency of the business operations to enhance productivity. It is a very critical task to overcome these challenges, but the crowd analytics solutions provide a visualized solution that makes it easy. The outcomes of crowd analytics solution help user to know real time information on the roads and provides the most efficient routes in the city to travel. The solution combines the capabilities of intelligence and real time data to provide the real time situation in a visualized form. The crowd analytics solution is provided with the real time audio visual inputs, which are integrated with the intelligence to deliver the hidden patterns in the human behavior. These results are found to be very useful in analyzing the effectiveness of outdoor media. The sentimental analysis help monitor and analyze the mood of the crowd that enables brands to precisely measure the effectiveness of their advertisement campaigns and generates the right content with respect to the collected data. It also provides the insights into the interest of the viewer in the advertisement. The governments in different countries are very serious about the public safety especially at the places where large numbers of people are involved. Thus, the governments are taking various security initiatives to avoid mishaps at the populated places. Crowd analytics solution deployment is one of the initiatives, which is becoming popular in making the crowded places safer. The real time crowd analytics in public places is becoming necessary to avoid disasters related to crowd and ensure public safety. The solution captures real time crowd-related data and combines its artificial intelligence to deliver detailed visual analysis of the crowd. The analysis includes the number of people in the crowd, their behavior, and other characteristics, which help the user in situational analysis and make appropriate decisions as per the situation. What are the upcoming industry applications for crowd analytics? High initial upfront cost is a major factor restraining the growth of the market. Using dedicated Central Processing Units (CPUs), servers, DVRs, NVRs, and other appliances for video analytics is a costly process. The volume of video streams from day-to-day surveillance is rising and will continue to increase among the organizations and various other end users. Analyzing the huge and ever-increasing volume of video streams require centralized and high-performance processors which are very expensive. Moreover, in a server-based approach, each processing unit can support only a limited number of cameras, and requires higher network bandwidth as well as video management capabilities. Furthermore, edge-based video analytics appliances are also expensive due to embedded analytics and Wi- Fi capabilities. Hence, the high cost of systems is a major restraint for the video analytics market. Major vendors that offer crowd analytics solutions across the globe are Nokia Corporation (Finland), AGT International (Switzerland), NEC Corporation (Japan), Walkbase (Finland), Spigit, Inc. (U.S.), Wavestore (U.K.), Savannah Simulations AG (Switzerland), CrowdANALYTIX, Inc. (U.S.), Securion Systems (Ireland), Crowd Dynamics (U.K.), and Sightcorp (The Netherlands). 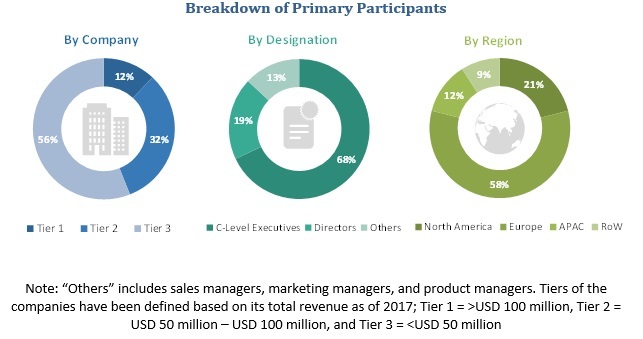 These vendors have adopted different types of organic and inorganic growth strategies such as new product launches, partnerships & collaborations, and mergers & acquisitions to expand their offerings in the crowd analytics market.